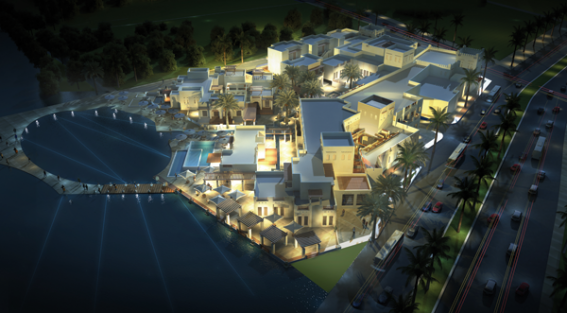 This project is comprised of 3 elements: a boutique hotel with 150 rooms, luxury suites, villas and palaces for families, a marina, and a retail and banquet hall area, which includes specialty restaurants that serve hotel residents as well as outside guests. The unique design of this hotel earned Dimensions 2nd prize in its competition, putting our firm ahead of many international firms that participated in this competition. Its traditional design creates an added value to the project as it also acts as a tourist attraction. The axial layout of the different elements maximizes use of the site and provides each of the facilities with its desired level of privacy. There are several entrance points around the site. 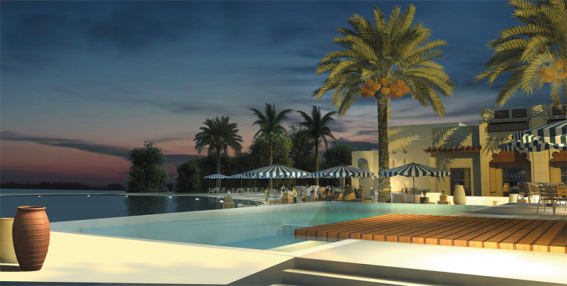 The business facilities are located street-side, while the residential and hotel accommodations lie on internal gardens to add a level of privacy and segregation from the general public while still providing them with views of lush gardens, the pool and the sea. I cant see the pictures! I can see them just fine !! I still think it was a mistake to destroy the old one, I really liked it. it was unique compared with this. Traditional heritage architecture for the win, keep the essence of Arabian Islamic Qatar alive. Doha nowadays is a way more "mature" city than it was few years back, instead of just malls and tall buildings we're focusing on the more important aspects. views have been maximized in the scheme allowing for unobstructed views.